I am always hearing faint noises. I have heard my name called in a sweetly whisper 2 different times. My dog seems to stare at things I can't see and at times he will come running, yelping all the way and jump in my lap like something did something to him. My daughters 2 dogs have took off running into my bathroom barking like crazy at seems like nothing but took photo's and had what looked like orbs (not sure that's what they are) (I used no flash in this one photo). There was no water anywhere. I have heard "whew" faintly many many times. I look and see nothing. No one in the house but me. So when I took this pic I wasn't sure what to make of it. 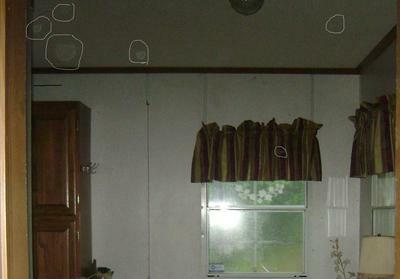 Comments for Could these be orbs? You say you didn't use a flash, but the doorway frame at the far left shows a bright light at camera height, the door in the background shows a sharp shadow behind it at a straight angle as though camera height, and the window shows a bright reflection from camera height. None of these angles work for an overhead light. And if it had been a bright lamp behind the camera, then the photographer's shadow would be present. And if you had used a bright lamp, that would be no different than a flash. Light reflects off dust in the air creating "orbs."